Vault of Light: 20 Days of Gold Making - Day Seven. 20 Days of Gold Making - Day Seven. "If you were starting over again (maybe on a new server perhaps), how would you start building some capital & what goal would you set yourself?" I'm actually experiencing this first hand at the moment on two separate servers. I introduced my best friend to World of Warcraft late in the Wrath of the Lich King expansion. Using Recruit a Friend we initially leveled our characters really fast, too fast. With her being completely new to the game I had her roll a character on my server. While she enjoyed the game she fell pregnant during early Cataclysm and stopped playing. Now baby is just over one year old and sleeping well during the night she has her evenings mostly to herself giving her time to play again! Which works out great for me as WoW is a great way for us to keep in touch since I moved away from home. Thankfully with real ID we're still able to play together as I transferred off of the server not long after she quit playing. One problem leveling so fast caused was her never having very much gold. Given that she's completely new to the game and finds a lot of it hard to grasp introducing her to the auction house and especially auction house addons is the last thing I want to do right now! So I've decided to make her some gold so it's one less thing she needs to worry about. Not a vast amount, I'd like her to get there on her own eventually but for now I want her to be able to buy things without having to worry about not having enough gold to repair or buy gems. I want her to have enough to buy a reputation related mount if she wants to. I have a level eighty three very much abandoned Rogue left on the server which I have no intention of ever leveling. Now is the absolute perfect time to start on a new server or to start building a bit of capital if you're just starting out as the Darkmoon Faire is in town. . 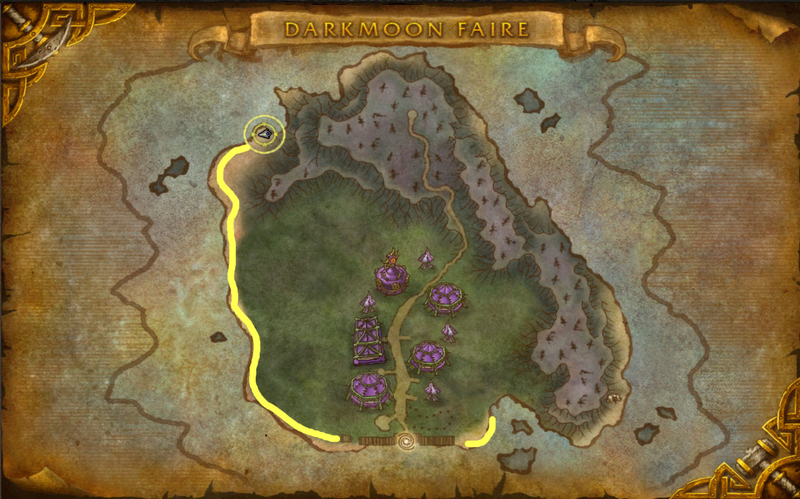 In the water surrounding the Darkmoon Isle are fishing nodes called Shipwrecked Debris. Fishing from these pools awards you Sealed Crate's. Inside the Sealed Crate will be Mists of Pandaria crafting materials and potions (providing your game is upgraded to Mists of Pandaria). Each pool can contain one or two crates. The great thing about this is it can be done with lower levels as there are no hostile mobs in the area. While the Shipwrecked Debris can spawn all over the isle I tend to stick to the western shore as I can run along it without having to swim or jump over cliffs, especially good if you are on a lower level character. In half an hour I was able to fish up twenty eight crates although I was able to mount to run between pools. I picked up three mote of harmony which for the moment are pretty useless however I was able to sell the following mats. The crates also contain a few silver each. If the Darkmoon Faire isn't ongoing then don't worry there are plenty of other go to gold making tactics for starting out on a new server. Gathering - Pick up two gathering professions while you level. I personally prefer Mining and Skinning. I feel with Mining and Herbalism I end up running all over the map chasing those yellow dots! I prefer Mining over Herbalism due to the Smelting part of the professions. You can often find Ore which you can Smelt into Bars and resell at a higher price. Flipping Vendor Items - If you're playing Alliance there is a vendor is Stormwind Kendor Kabonka who sells Cooking recipies. You don't have to have cooking to purchase these. You can purchase them all for only a few silver each (he sells two BoP recopies - don't buy those). They can sell on the Auction house from anywhere between 4g and 100g. Your server may vary. I find around 35g to be a reasonable price to sell them at if there aren't any on the auction house. This guy is just one of many. Visit this post on The Consortium with multiple lists of vendor and limited supply recipes. Battle Pets - One of the great things about Battle Pets is that you can cage them and trade them to other players or sell them on the Auction House. If you've created a new alt on a smaller population server than the one you ordinarily play on this can net you some serious gold. Having previously played on a High population server I was able to buy several level twenty five pets for under three thousand gold. I later sold these on my own Medium population server for nine thousand gold each! The pets you obtain from Vanilla raids which as part of the Raiding with leaches achievement can all be caged and sold. With your higher level character on your main server you can easily farm these pets once a week from Molten Core, Naxxramus, Blackwing Lair and Ahn'Qiraj. When on your new character on your new server, open up your Pet Journal, find the pet and right click on it to cage it. This can then be sold on the Auction House. They don't always sell for much but if you're just looking for a bit of start up cash they'll certainly do the trick. Flipping items - These methods should help you gather a bit of gold and once you do you can start browsing the Auction House for items to flip. I flip a lot of armour for either transmogrification or for leveling characters. At level seventy seven you can begin wearing Cataclysm green armour and at level eighty three you can begin wearing Mists of Pandaria green armour. As these items increase your stats by an crazy amount people are willing to spend a lot of gold on them for alts. I typically buy these green items for under sixty gold and resell them for two hundred and eighty. Be aware of the stats on the armour before you purchase them. No one is going to want that plate helm with Strength and Spirit. Mithrildar posted a collection of useful gold making threads post on the Consortium Forum with posts detailing acquiring capital, crafting, flipping and addons which is absolutely fantastic for anyone starting out.